Oh yeah, let’s all get in the car and head over to K-Mart on this beautiful Friday morning!! Actually, it has probably been more than 10+ years since I have stepped foot in a K-Mart store, and the one that was closest to my house was converted into a new Sports Authority store 3-4 years ago. This card is from the 1982 K-Mart 20th Anniversary set. The set features cards of the MVP’s from the league while also celebrating KMart’s 20th Anniversary. 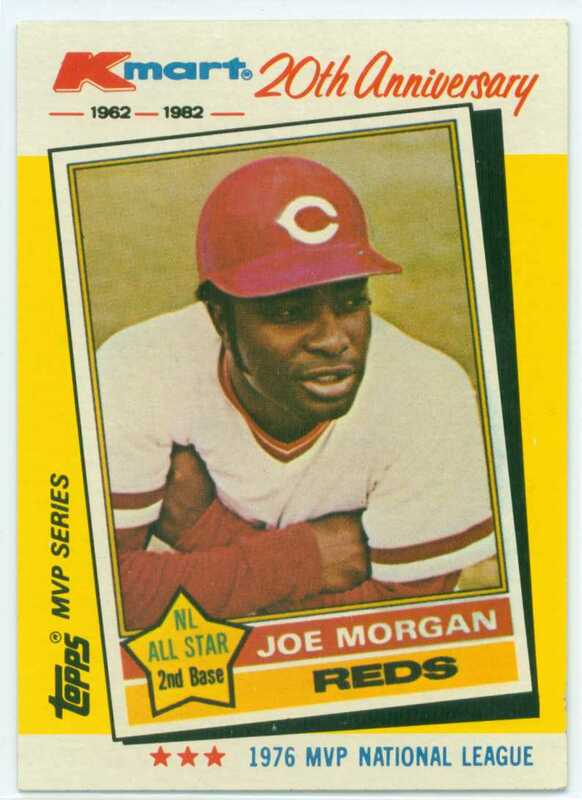 I already had the card of Joe Morgan from this set that featured his 1975 Topps card, so it is nice to complete the set of Morgans from this neat and oddball set from the 1980’s. This entry was posted in Joe Morgan Collection and tagged 1975 world series, 1976 world series, all-star, baseball, baseball cards, big red machine, Cincinnati Reds, gold glove, Hall Of Fame, HOF, joe morgan, most valuable player, MVP, reds, second base, world series. Bookmark the permalink. Loved these K-Mart comm. sets! HILLS also had an exclusive set. These were high quality, glossy cards, too. Pancuco- I have a few of the Hills cards and while they are nice oddballs from the 1980’s, I really like the vintage feel of the KMart set. That old cardstock takes me right back to when I was ripping through packs as a kid. Ive got Vida Blue Signed along with others from this set signed but you know im from atlanta and that record breaker from a man who was getting death threats before he broke that record that is still to this day my clearest greatest memory from hammering Hank Arron. Beautiful Card man!